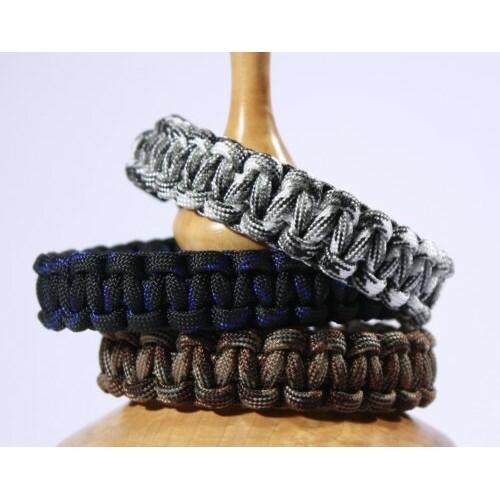 Survival Bracelet for Men, made from Parachute cord or Para-cord. This is an amazing gift for everyone, beautiful and useful! A Survival Bracelet is a great survival too and a symbol of strength and survival. First used in World War II Para-cord can withstand 550 pounds of pressure, yet it is light wieght, mildew and rot resistant. You can take apart your bracelet and you would have about 6 feet of Para-cord ready to use. This bracelet is an easy way to carry several feet of parachute cord easily, which can be used in an emergency. Bracelets are about 8.5 inches long with a plastic side release buckle. If the bracelet is a little big when you receive it you can soak it in warm water for about 5 minutes and then air dry and it should reduce by about a 1/4 inch.